Better than nothing, not better than The Thing. 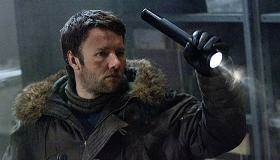 A 2011 prequel to John Carpenter's practical effects horror/sci-fi classic from 1982, The Thing (same title, which is, bluntly, confusing) offers audiences a similar-but-not-the-same mix of effects, existentialism and creepy body horror while forgetting the things like character, humor and tension that made Carpenter's take on the same material so memorable past the initial fearsome fluid flesh sequences. Audiences—especially young audiences without memories of Carpenter's take to compare it to—may give The Thing a brief good run in the pre-Halloween box office, when they're looking for things that go bump in the night prior to Paranormal Activity 3, but it's hard to imagine this re-mixed prequel having the legacy and love that the '82 version built up. Just as in both prior versions of the film and the original short story, John W. Campbell's 1938 "Who Goes There? ", a group of Antarctic scientists dig up a crashed spaceship and the sole passenger, frozen in ice for 100,00 years. However, it turns out that the visitor is not only alive once thawed out, but can change shape and perfectly imitate any victim's form, voice and memories. Soon the entire Antarctic base is consumed by paranoia, as any person on the base—or more than one person—could be the creature. It's worth noting that the shape-shifting plot point is in Campbell's original story; the 1951 film version, directed by Christian Nyby (and an uncredited Howard Hawks) and limited by technology, had the creature played by the six-foot-seven actor James Arness, whose inability to change shape was made up for by his having so much of it. Much of this is just second-verse-same-as-the-first reiterations of material from the Carpenter version—similar set and creature design, similar shots of snowy wastes and gruesome transformations. Director Matthijs van Henningen Jr. has access to computer-aided effects Carpenter and his team (including the legendary Rob Bottin and Stan Winston) could only dream of; at the same time, no amount of busy, clacking CGI can ever equal the wet smacking flap of Bottin's grisly rubber-and-goo practical work. The script, by Eric Heiserrer, makes one dumb misstep for its every smart elegant move. One early discussion—of dental work and shape-shifting—is smart, on point and clever; later, though there's a moment where Winstead escapes the creature by going around a corner where it can't reach. Considering that we've already seen the beast detach limbs as autonomous murder-animals or stretch flexible flesh-columns like lethal taffy, this seems a bit much. The Thing isn't truly horrible—better auds get Halloween horrors from this than, say, another wretched Saw film—but the overall feeling is like that of watching an immensely talented cover band, or a truly inspired karaoke performance: No matter how good it gets, you're acutely aware that you're watching something done previously, with more energy and more inspiration and, ironically, less money. At its best when it clearly resembles Carpenter's version—and with a finale that may have James Cameron and H.R. Giger calling their lawyers—The Thing can still mine tension out of a room full of people in parkas who simply don't trust each other, and know their lives hang in the balance. Asked to re-visit a classic, the cast and crew here go through the paces admirably, but, much like the film's fearsome monster can ape the shapes and sensibilities of the people it devours, no matter how good the exterior details may be, on the inside, this film's just a wet and sickly imitation of a fully-formed and deservedly much-loved classic.